With the sandy soil of Breckland beneath my feet I walked the Desert Rats trail in ThetfordForest. The 7th Armoured Division, who had earned their nickname in the sands of North Africa, had been stationed here in the months leading up to D. Day in 1944. 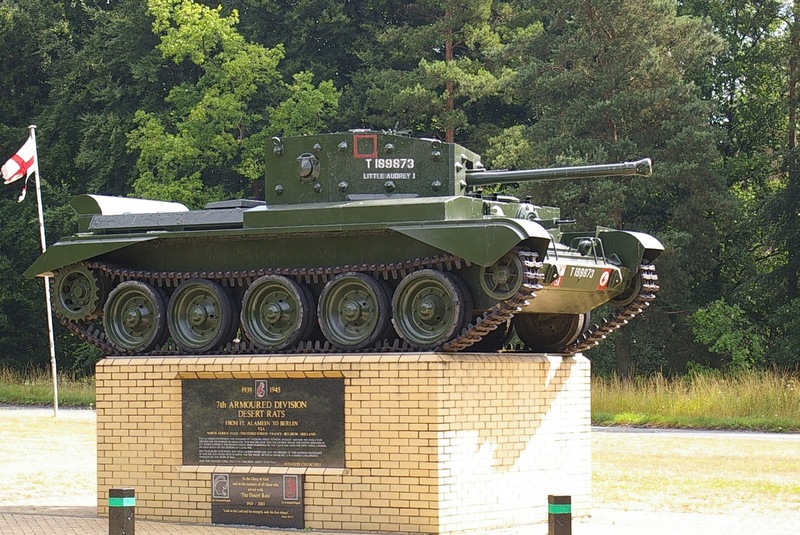 There is a Cromwell Tank beside the A1065 between Mundford and Swaffham which is a war memorial to their dead and marks the beginning of the walk. A way-marked path with interpretation boards leads visitors around the site of the former camp and tells the history of the famous fighting force. I made the easy 2 mile walk in reflective mood. It was, you could say, an act of remembrance. I am a war baby and my father had served alongside the Desert Rats in North Africa. By way of coincidence my son is serving with the 7th Armoured Brigade today, providing boots on the (sandy) ground in Afghanistan.